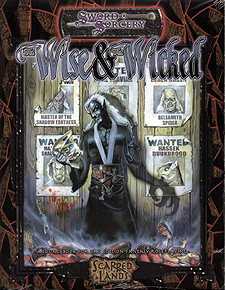 The Wise and the Wicked introduces a host of extraordinary movers and shakers - those who carry out the will of the fates and who can be valuable friends, useful resources or tenacious foes for the player characters of your campaign. Herein you will meet King Virduk, master of a vast and powerful empire of evil, and his wife Geleeda, beautiful and black-hearted. Also intruduced are heroes like Katonis, vigilant of Vesh; Meerlah the bard, infamous throughout the realm; and Andelais the incarnate, servant of nature. As for Yugman the Sage, the mysterious and capricious source of wisdom and knowledge: who can say what side he is on? These people and others lurk within the pages of this volume, a compendium of fascinating characters suitable for campaigns in both the Scarred Lands and elsewhere - the kind and the curel, the courageous and the craven and, of course, The Wise and the Wicked.